Located nearly 480 kilometres by air northwest of Vancouver, British Columbia, Tweedsmuir North Provincial Park is a 2.5 million acre spectacular wilderness area. Redfern Lodge is located within the park, at Eagle Bay on the 52 mile long Eutsuk Lake. Located nearly 480 kilometres by air northwest of Vancouver, British Columbia, Tweedsmuir North Provincial Park is a 2.5 million acre spectacular wilderness area. Redfern Lodge is located within the park, at Eagle Bay on the 52 mile long Eutsuk Lake. Here, visitors can enjoy activites such as canoeing, pontoon boating, hiking, wildlife viewing and world class fly fishing in fifteen lakes and four rivers. They take visitors to waters that haven’t been fished in years, and are always looking for new ones to explore. To get to Redfern, guests must make their way to Burns Lake, where they’ll board a Beaver Float Plane that takes them directly to the lodge. 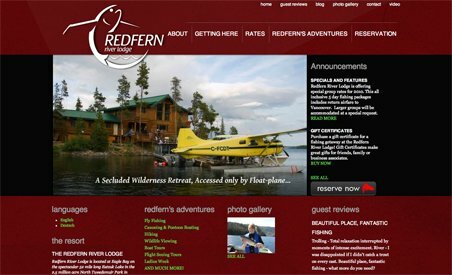 As Tweedsmuir North’s only lodge, Redfern gives guests the unique opportunity to experience a remote, spectacular area of British Columbia.